A SUBMERSIBLE DUFFEL BAG WITH A ZIPPER! Outfitted with YKK waterproof zippers and RF welded from double-coated (PVC-free) polyurethane, this commercial grade ‘Made In The USA’ duffel is truly waterproof – submersible to 15 feet! The wide 1.5” nylon webbing handles were designed to be long enough to use as backpack straps, should the need arise. And the 4 deluxe D-rings are perfect for securing the duffel in almost any situation. Compared in similar thicknesses polyurethane is superior to PVC most every way: cold weather, direct sunlight, chemical resistance, crack resistance, abrasion resistance, environmental friendliness, and overall strength. And we chose some of thickest double-coated polyurethane to maximize all of these positive characteristics. 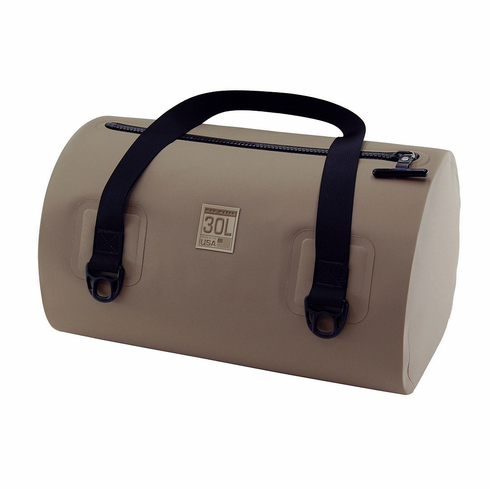 The Coyote Brown version of the Waterproof USA Duffel was geared to meet the needs of the Fishing and Hunting markets. The matte finish of the Coyote Brown color and subdued 2-tone brown label won’t stand out in the wild, and blends nicely with your other fishing and hunting gear. And not only is our waterproof bag manufactured in the USA, the YKK zipper we use is now also manufactured in the USA – also in the state of Georgia, in fact. Carry Weight: 1 lb. 8 oz.